Just when I thought Clicgear couldn’t possibly improve upon their previous golf push cart design they come out with another model. I have been a fan of Clicgear for many years now but I am always looking for the next best thing. Whether it be a better golf push cart from another company or Clicgear, I want the latest and greatest. In the case of push carts, the latest and greatest comes in the form of the Clicgear Model 3.5+. I am a golfer who appreciates the ability to customize my cart to my liking and the Clicgear Model 3.5+ allows for unprecedented customization. Golf is a sport that hinges on making adjustments on the fly and the Clicgear Model 3.5+ mirrors that trait with how versatile and easy to use it is. If you have not yet checked out the Model 3.5+ yet allow me to introduce you to it. 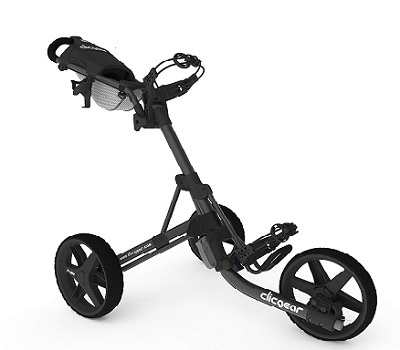 The Clicgear Model 3.5+ was designed for golfers who need very specific things from their cart. It allows you to change up what accessories you have on the cart at any given time. For example, say one day you are on the course and it starts to rain. There are 4 changeable accessory tabs that come along with the Clicgear Model 3.5+ so you can deploy an umbrella on the cart if it gets too hot or it starts to rain. Another scenario: you are almost at the end of your round and need to take a seat because you’re tired. The Clicgear Model 3.5+ accessory tabs allow you to attach a seat as well. There are 4 accessory tabs that receive various Clicgear accessories so it is really up to the specific needs of the golfer. One of the first things that struck me about the Clicgear Model 3.5+ was the build of the body. It is made out of aircraft grade aluminum and you can really tell because it feels strong and sturdy to the touch. This is not a cart that will buckle under a lot of weight. There are simple clip-in bag straps and the bag saddle itself is adjustable so your bag won’t flail around on the course but it is the sturdy aluminum framing that gives this cart its lugging capacity. I got the charcoal and black version and I love the way it looks. It has a clean look and the aluminum framing doesn’t scratch easily so it pretty much looks the same now as it did when I first got it. Bear in mind that this is a 3-wheel golf caddy and a 3-wheel design in my mind is superior because it just looks cooler. Not a good enough reason? Ok fine, the practical use of a 3-wheel cart is that it makes it easier to maneuver when compared to a 4-wheeler. If the clean black look isn’t your thing don’t fret. The Clicgear Model 3.5+ comes in 7 different color schemes. Clicgear has maintained the easy fold down process of the 3.0 model. There is a red lever on the front when that unlocks it so that it lays flat on the ground. There is another lever in the middle of the saddle that collapses the body. From there you just fold the whole thing down to dimensions of 13” x 15” x 24” and lock it. When folded down it only weighs 18 pounds. The bag straps on the 3.0 model were no adjustable which was its largest flaw in my opinion. Clicgear has corrected this in the Model 3.5+. There is also a larger storage net on the 3.5+ than can easily fit a phone, spare shirt and extra tees. The front console has also been expanded. There is a hand brake now too! You don’t have to bend over to engage the brake on the Model 3.5+. As corny as it might sound the Clicgear Model 3.5+ allows me to be the versatile golf player that I need to be. It is supremely customizable, moves around very nicely on the course with the rubber wheels firmly gripping the terrain and even the handle is angle adjustable. I think not being able to have a giant sized drink and the multi-step fold down procedure are small prices to pay in light of the overall aesthetic and functionality of this cart.